The 68 Plus has been built in the brand new Avigliana-based Azimut yard: 21 metres of modern and elegant design, based upon the design ethic of producing a substantial, elegant, sophisticated and innovative boat. Most importantly, this is a boat which, conceptually, could be accepted in all markets, and which should meet the requirements of the most refined connoisseur. In fact, the Azimut Group has successfully launched not only a splendid boat but also a brand of production philosophy of extremely high technology, together with the highest quality standards. This writer finds it difficult adequately to describe this masterpiece, relying on the pictures taken and memories of the extras on the 68 Plus. The length overall is actually calculated without the aft bathing platform, which adds another meter to the total; the side glass windows, in addition to the trademark elliptical shape, are mirrored and electrically operated from beside the cockpit. 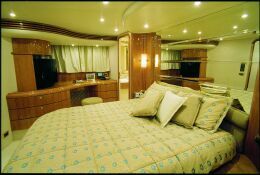 In the master suite, amidships, large vertical portholes have been included so increasing the interior lighting; the guardrail is completely new and redesigned, with a cross-over amidships. Beyond the aft entrance door, there are also two side portholes in the american style; the access ladder to the bathing platform is motorized and can be concealed together with the mounting ladder so that the aft is clear when manouvering. The fairlead with anchor chain at the bow pulpit and the aft fairleads are electrically wound. The effort and attention given to the detail, styling and design is truly innovative. Post-modern design concepts, typical of the fifties, have been applied tastefully! Hinges, handles, even the flybridge furniture that hides a fridge, barbecue and sink, resemble 50's style. 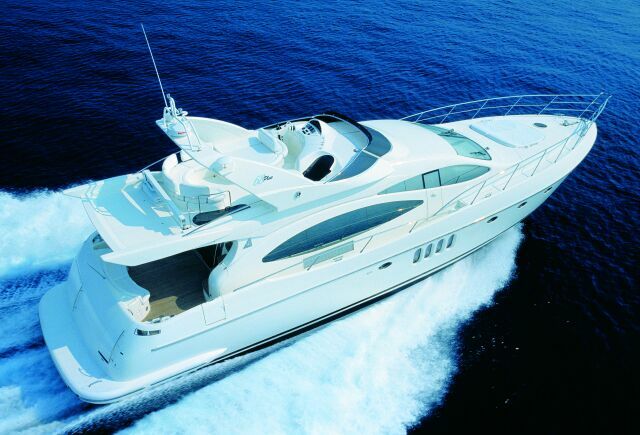 World Boat for Azimut 68 Plus, a motor yacht that will play a leading role in all the seas of the world. on side deck, two side doors in the wall of the two side decks. hauling and launching system with tender of 3.20 m; amidships curved fly table and semicircular divan transformable into sundeck, helm station complete with all electronic switchgear, pilot and co-pilot seats, galley furniture complete with fridge, sink and barbecue. 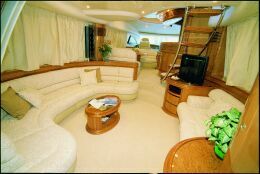 Layout and internal characteristics: day section with large saloon on two levels with aft, two opposing settees, bar with ice-maker, cabinet with Stereo, TV and VCR, steel and teak access ladder to the flybridge, galley in two typologies, helm station. Accommodation includes four double cabins, all with en suite bathroom; the master stateroom is amidships with vanity cabinet, settee, wardrobes, TV and stereo cabinet (the en suite bathroom in this cabin has two sinks and the shower stall converts into a Jacuzzi). The two guest cabins both have twin beds and en suite bathrooms with shower stall (the starboard cabin can be converted into a captain's cabin, studio or a fully-equipped laundry). 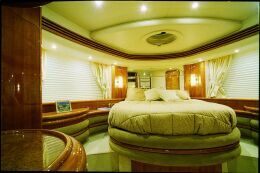 Last but not least, forward there is the VIP cabin with double bed and fully equipped bathroom. 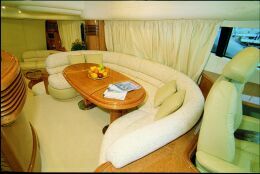 Aft is the crew area with three beds and en suite bathroom. 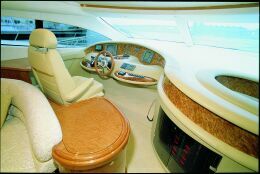 Furniture is in cherry-wood, ceilings are in lacquered wood and synthetic leather, upholstery may be chosen by the owner. Galley: in the centre of the saloon which can be concealed by a horizontally sliding door in cherry wood, ceramic hobs, dishwasher, garbage compactor, 290 lt. fridge, microwave oven, double sink, worktop in shiny black granulon, teak floor, sliding door,cabinets, cupboards and shelves. Optional fittings: MMC synchronizers, fittings for desalinisation equipment. Sea keeping ability, turning and behaviour on waves: excellent stability and manoeuvrability. The Azimut-68 Plus moves very little water to the side, it maintains stability and performance, is low and fast on the water and looks even better at speed due to the design and the exterior lines. Docking manoeuvrability: excellent and safe. Helm positions: excellent, functional, with futuristic technology and elegant design. Galley: well designed and functional. Bathrooms: very large and stylish. Electrical switchgear and plant: excellent.